Bought this piano to use at gigs and some home recording work. If you're getting this as just a digital piano and not planning on switching effects much, then this is the piano for you. At $1k, it has all the important features of your higher-end Roland keyboard at a very affordable price (1/4" stereo output and 3.5mm output, MIDI out, the phenomenal SuperNATURAL sound engine that even models piano harmonics, and escapement). However, at its price it is of course not going to have the features of the 2,3,4k Roland keyboards. You have very limited sound layering due to its interface (You can't layer strings and choir for instance, since they are both in the "Other" bank, but you can layer strings and piano since piano is in a separate bank). Switching sounds is also a bit irksome, and impossible to switch between sounds in a bank while playing, since you need to hold down the bank button and then push a key on the keyboard. So if you're planning on doing a gig where you have to quickly switch between strings and jazz organ for instance, either look at seeing if you can hook some sort of MIDI input into it to do that, or get a different model that has a better button interface. But if you're like me and plan on just using the acoustic piano sound and not much else, you're not going to find anything else like this in its price range. The pedal that comes with the unit is also not great if you're used to an acoustic piano pedal. Do yourself a favour and pick up something like the M-audio pedal, the square pedal, while I'm sure is reliable and will last many years, just isn't great for classical playing, it tends to slip around a lot and just doesnt have the same effect as a proper pedal. To get a three pedal system, it doesn't appear that there is a standalone system (Roland makes a standalone 3 pedal system, but it outputs 3 1/4" jacks, which this keyboard does not have the inputs for). You'd need to get the dedicated stand and tri-pedal input to get your three pedals for this system. However, these are nitpicks, and after four months of owning it, I can say I like the action and sound of this much more than Yamaha's GHA line which is in a similar price point. Go in, try it out, and keep these limitations in mind. I expect this system to serve me many years. This is a great keyboard and it does feel very close to playing on a nice upright piano. I am impressed with the key action for this price range, and the ivory like keys are a plus. The piano sounds are great, and the onboard speakers are sufficient for my needs and it just sounds really good. It can easily be amped or connected to a DI, and has replaced all of my piano samples in my DAW. Where this unit may appear to lack in terms of features compared to some DP's it excels with its key action. It is obvious where the designers allocated the cost of building the instrument, the keys. 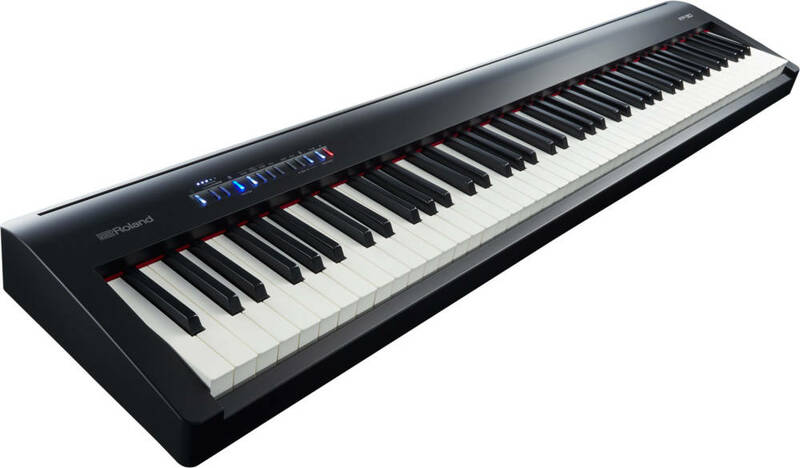 I've had this piano for about 2 months now, and I can confidently say that it is one of the best sounding digital pianos in its price point, When I first compared it to the Yamaha P-125, the feel and the sound was just deeper and had more feedback. As a causal piano player, I feel that this piano gives me all of the stuff I asked for and more. It is not perfect however. I feel that in the speaker sound department, it is lacking in comparison to the P-125 since it is a downwards facing speaker. However, this is not such a big problem as the earphone jack is extremely good and I can actually hear the vibrations in hitting the low notes. In addition, the piano app for this piano is very outdated and needs touching up. The user interface is really confusing to use and newest songs that were recorded recently don't go to the top, they stay at the bottom. All of the parts have arrived that had not arrived when I wrote the previous review. I am not disappointed at all. The pieces were easy to install and the result is a splendid sounding piano with the traditional three peddles and more features than I will use but which I appreciate the quality of very much. All features function as expected and as advertised. So far not problems. I am using this instrument as an apartment piece where it fits in easily and so additional amplification is not something I aspire to at this time although I can imagine it could be used at pro or amateur gigs with added volume that that would require.. I bought this after reading the reviews of experienced musicians who were completely satisfied and now that I have it I can concur with those glowing reviews totally.Really nice grand and electric piano sounds with church organ and much more that I've just begun to enjoy. This instrument will be a very pleasant adventure. I gave it 10/10 because its everything I expected in a great looking design. I took piano lessons for 8 years when younger and wanted to get back into it and owning a condo, I was looking at digital pianos. 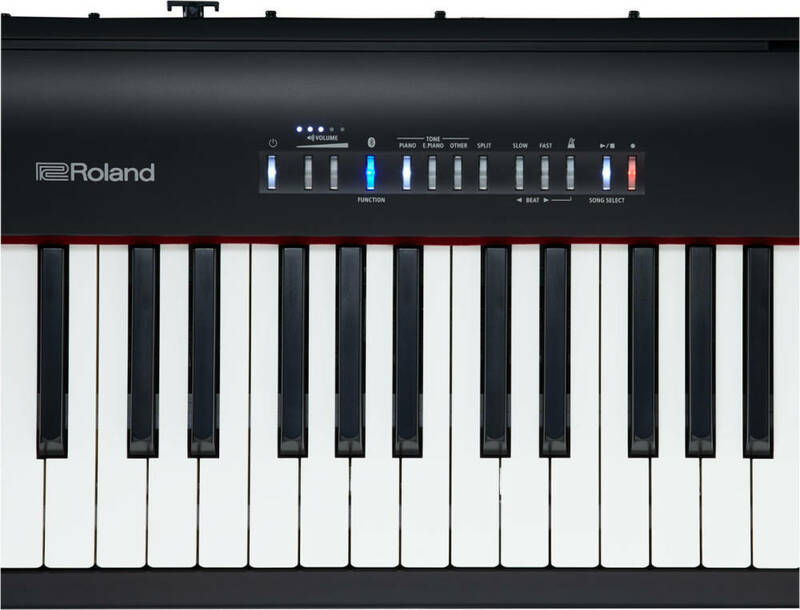 I tested some other brands in the store because originally I was thinking of getting a Yamaha but as soon as I started playing this Roland, I fell in love. The feel of the keys is sublime, the sound is incredible and there are 3 classical piano sounds to choose from. The keys are not shiny or rounded (if that makes sense) and I prefer it that way - flat. Also, the weight of the keys is just right - I find some pianos need more force to make a sound out of and it's not the case with this one so it makes playing the quieter, softer pieces so easy. It's pure joy playing it - I bought it almost 2 years ago, and I have been playing every week, sometimes every single day a week. I love the harpsichord and the church organ sounds. Like one of the other reviewers said, the sound is actually brilliant with headphones. I exported some of my recordings to USB and did some mixing with software as well, so I definitely made use of all the bells and whistles. Probably the best purchase I've ever made. Also, the sales associates at Long & McQuade were very helpful. I carried it home in a van cab. I absolutely love this instrument. I purchased this piano today after having been trying all other models for a month in every musical instrument store. I would say this piano has the best action in the price range, and I like it's Bluetooth connectivity. And I have to say the service is excellent! Knowing I don't have a car to take the piano home, they offered to send me home in a van. I will definitely come again! Have not been able to take my hands off. It truly feels like playing a grand piano. I have played for 37 years on organs, a dx7, and other electric pianos, this is truly an incredible leap forwards. Absolutely the best electronic instrument I have ever played; it really is like playing a grand. You can feel the hammers hit the strings, the heavier ones to the left... I find this instrument extremely, sublimely expressive with a wonderful touch. I cannot believe that I only paid 999 for this; it has only adequate internal speakers but sounds absolutely glorious with headphones or through studio monitors.